A short biography of council communist and organiser of underground networks, Alexander Schwab, who died in a Nazi concentration camp. Born on the 5th July 1887, at Stuttgart, Alexander Schwab was the son of a choir master. He studied at the Universities of Rostock, Jena, Heidelberg and Freiburg in philosophy, ancient languages, political economy and sociology. He was a member of the Free Students movement. After graduating successfully he taught at the Freie Schulgemeinde Wickersdorf (a free school set up in 1906) and was one of the leading lights of the Free German Youth Federation. Because of a lung complaint he avoided the draft during the First World War. He married and started to become involved in the anti-war movement. 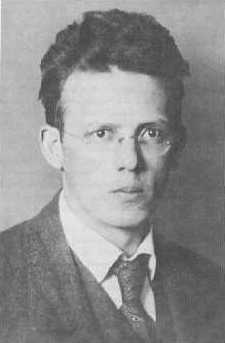 He joined the socialist USPD in 1917 and in 1918 the Spartakusbund, where he was close to Rosa Luxembourg and Karl Liebknecht. He was on the left of the communist party KPD and then was one of the founders of the KAPD. He was an occasional member of its executive committee and he represented the KAPD at the 3rd Congress of the Komintern at Moscow. After the exclusion of his close friend Karl Schröder from the KAPD he left it in 1922. Until the end of the 20s he chose to remain outside of active politics. In the following years he worked as a journalist and writer, specialising in economics and architecture. Starting in 1928 Schwab took part at first occasionally, then more frequently in discussions of the Sozialwissenschaftlichen Vereinigung (SWV) and later the Red Fighters while working as head of the press department at the Reich Institute for Labour Placement and Unemployment Insurance in Berlin from 1922 until his dismissal in 1933. In 1924 Paul Levi -former chairman of the KPD who had been expelled in 1921- set up the SWV. This was a loose union of socialists interested in theoretical and political discussions on the problems of socialism holding monthly meetings and weekend seminars. The meetings were attended mostly by oppositional members of the SPD, but also by others from the groups of the KAPD and the AAU. By 1928 the SWV had around 800 members within Berlin alone. In 1929 Karl Schröder and others of the old KAPD-Essen group came to the conclusion that the crisis of capitalism and the general political development would lead to a period of dictatorship and illegality for revolutionary communists. They started to build up an organization within the SWV of the most reliable elements, which became known as the Roten Kämpfer (Red Fighters). Many former members of the KAPD was recruited for the secret network and operated mainly within the SPD, especially the youth groupings, where they supported the left opposition and recruited to their network. From 1931 the Schröder/Schwab-group had fully taken over both the SWV and the bulletin Der Rote Kämpfer, which originally was set up by a local SPD oppositional group in the Ruhr. Schröder and Schwab began more systematically to transform the network around the SWV and RK into a disciplined organisation prepared for illegal political activity. After the Nazi rise to power Schwab was imprisoned for 6 months in April 1933. After his release and the death of his wife he set up, together with Franz Jung, a business press agency for banks, newspapers and specialist journals in 1934. He and Jung used this as a cover for underground political activity. Following the arrest of the leadership of the RK by the Gestapo in November 1936 he was condemned to 8 years imprisonment during the high treason trial in October 1937 against the Red Fighters as one of its leaders. He took a courageous stand at the trial and took entire responsibility for the organising of the illegal political work. In the following years he was in the prisons at Brandenburg and Sonnenburg and then in in the Börgermoor concentration camp where he was tortured. He died on 12 November 1943 in the Zwickau prison of pneumonia according to official data though like Muehsam and many others he may well have been murdered. After his release and the death of his wife he set up, together with Franz Jung, a business press agency for banks, newspapers and specialist journals in 1934. He and Jung used this as a cover for underground political activity. Who wrote this, and where might I get more information on how he used this agency as a cover for such activity? This article was posted for reasons of communication and dialogue, right? Am I the only person who has read it? I'd like to find out how this guy used a business press agency with banks as clients for revolutionary purposes. If I find out, I may consider buying such an agency myself and using it for similar purposes. No, lots of people have read it. we've just added comments to the tracker so people can see more new comments easily. You could PM battlescarred who posted the article and ask him to look here and see if he knows the answer.